After the fashion of my last post on Song Tea I wanted to highlight another exceptional tearoom that I encountered in San Francisco, Teance. This shop is a little different than Song Tea, for while they also sell their leaves for home consumption, they also have a bar (and tables) at which everyone can sit and drink tea. Teance has a very modern, carefully-designed atmosphere and construction. I was told that one of the two founders has a great skill in internal design and it was under his guidance that the tearoom’s physical appearance was shaped. The skill and attention to detail certainly shows. Paradoxically just behind a Pete’s Coffee, Teance sits elegantly in a pedestrian shopping district near the bay in Berkeley. While small, the shop feels roomy and cozy at the same time, from its stone Koi pond at the entrance to an upstairs seating area with beautiful wooden tables. But the most striking part of the tearoom is a round circular tea bar made of solid artisanal concrete inlaid with glimmering stones, glass, and shells (“artisanal concrete” may be the wrong term for this, but I didn’t know what else to call it). Atop this bar are two shining brass brew stations with a clever drainage system that carries the water away without a sound. The tea server stands in the center of the circle and graciously prepares a wide selection of Green, Oolong, Black, and Puer tea in yixing-ware, glass, and bright porcelain. As a tea drinker you may choose to have the tea master prepare your tea or reserve that honor for yourself with a thermos of hot water. You can probably guess which option I chose! In this way their service is similar to that of Camellia Sinensis in Montréal, but what surprised me was the effect of the circular tea bar. It somehow brings people together. 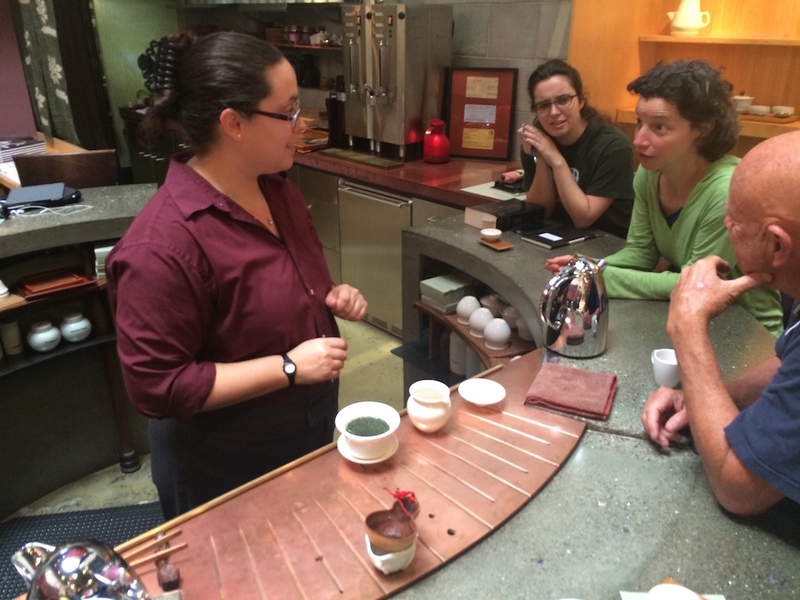 In many ways, the tea bar has the same effect as the custom bamboo bar at Tea Drunk in NYC, making what could easily be a solitary or insular experience of sipping a fine Wuyi Yancha into a kind of social event. One is magically drawn to talk to the other patrons at the bar, as well as to the person serving tea. Particularly at Teance I found that the curved nature of the bar made it nearly impossible to avoid looking at other tea drinkers and so snatches of conversation naturally jump around. Also just like Tea Drunk, the tea servers are always hovering nearby to provide a bit of knowledge or suggest another tea profile to taste. The pouring of water, the sipping from cups, and the discussions that take place flow almost organically. I find it a real pleasure to share tea in this way. I visited Teance twice and one thing I noticed quickly was that they have more teas available than what is on their menu. I suspect that many of their more rare teas are of such a small quantity that printing them on their menu would be a waste since they may change or disappear with short notice. So, just like when discussing tea with any knowledgable vendor, be sure to make inquiries about your preferred style before purchasing a pot-full! You may find something similar but more exotic to tempt your taste buds. One of the first things I tried there was an exquisite 18-year-old Sheng Puer. The taste was deliciously heavy, textured like old leather, and with a musty aroma like an ancient book. At the same time it was mellow and comforting, without any of the sharp cedar characteristics that would be present in a younger Sheng. It was definitely Sheng, though. 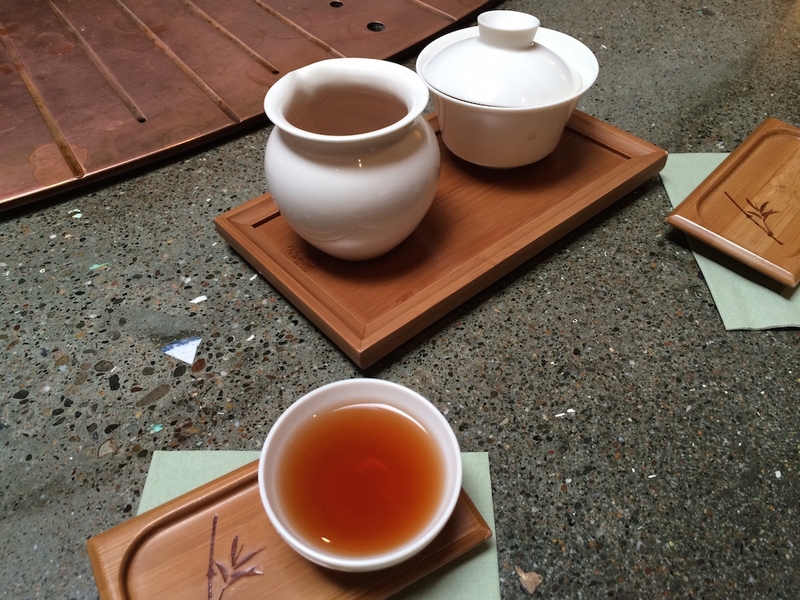 There’s something nearly unmistakable about the sweet-yet-musty flavor of a traditionally aged Puer. The only other tea I’ve had which has anything similar is a 1986 Yiwu which, sadly, has all been imbibed. To quote myself on that venerable tea, “Sipping this tea is like walking in to a comforting old library.” I think the same is true of Teance’s Sheng. I have to say that (as happens time and again) I was surprised to discover a tea that I knew very little about, and another that I had never heard of before! I have tasted the oolong known as Golden Turtle on a few occasions, but I rarely hear of it being sold in the West. It is a beautiful and rich Yancha from the Wuyi mountains of Fujian province with aromas reminiscent of cinnamon and charcoal, and here it was in a jar before us. Our tea server, Keiko, then showed us yet another Wuyi oolong, this time one that I had never heard of and actually had to look up. Teance calls it “Halfway up Sky”, but I’m going to try to remember the Mandarin name, Bàn Tiān Yāo (半天腰). The aroma of the damp leaves was a little like roasting rice, charcoal, and toffee. Much to my regret I didn’t have time to taste all these luxurious teas, but be certain that I’m going to look around for some in the near future. Many thanks to Keiko and Teance for the experiences and the tea discussion. I clearly need to spend a week in Berkeley some time to get to know this tearoom (and Far Leaves!) a little better. 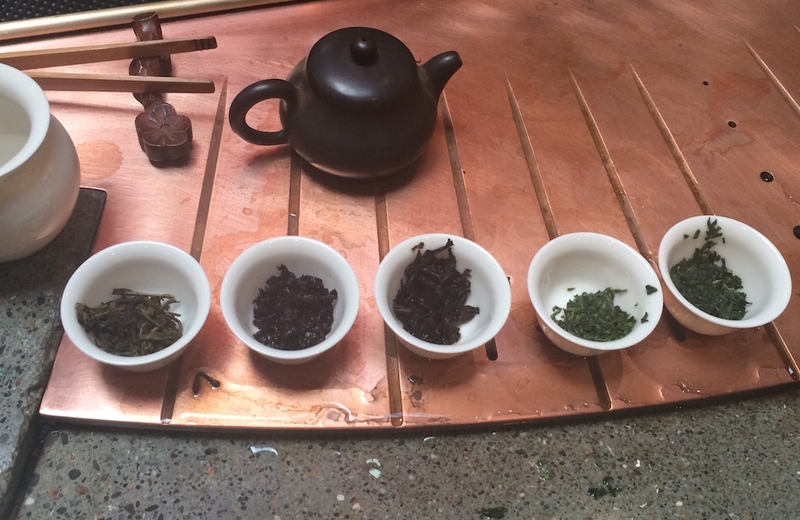 This entry was posted in Tastings and tagged baihao, oolong, puer, sanfrancisco, sheng, taiwan, teance on October 24, 2014 by payton. Words and photos on this site are licensed under a Creative Commons Attribution-ShareAlike 4.0 International License.